The Yamaha P-121 is a compact digital piano with 73 keys that combines incredible piano performance with a user-friendly, minimalistic design. Easily portable and extremely accessible, this instrument allows you to experience the joy of playing the piano on your terms. The P-121 allows for incredible dynamics and expressiveness. The Pure CF Sound Engine includes the sound of the renowned Yamaha CFIIIS 9' concert grand piano. It is the result of over a century of acoustic piano craftsmanship combined with state-of-the-art technology and expertise. 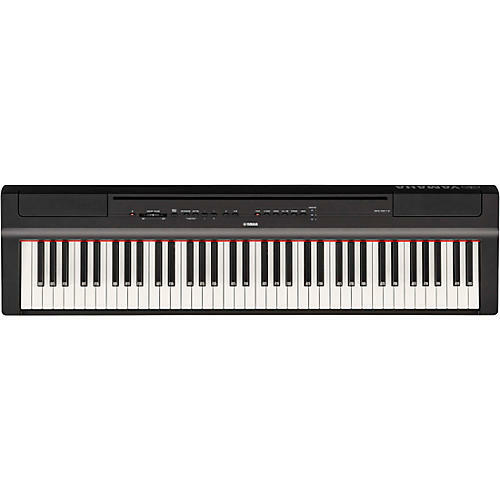 In addition, the Graded Hammer Standard 73-key piano keyboard provides a heavier touch in the low end and lighter touch in the high end, so it can be played with the expressiveness of an acoustic piano. Smart Pianist allows you to control the many functions included in your Yamaha digital piano with your smart device. Voices, rhythms and other settings can be selected through the familiar touch screen of your phone or tablet, making it easy to control the functions of your piano. You can also use the Chord Tracker function to learn how to play the chords of your favorite songs. Chord Tracker analyzes the songs from your music library on your iPhone or iPad and displays the chord symbols so you can play along! Find new ways to enjoy your P-121, using smart functions that only a modern digital instrument can provide. When using headphones, the Stereophonic Optimizer lets players enjoy the same dispersed sound heard when sitting in front of an acoustic piano. With the Stereophonic Optimizer, Voices sampled from acoustic pianos appear to come from the body of the instrument. This provides a comfortable, natural experience that eliminates the downsides of performing with headphones.